This morning Mike came by to help chalk again. Here you see mike in the foreground and Canadian naval ships in the background. Canada is not part of the coalition of the willing. As we go about our lives it is easy to forget that there is a war going on and our brothers and sisters are dying. Nancy Hiss wanted to do the names project so that she wouldn’t forget. 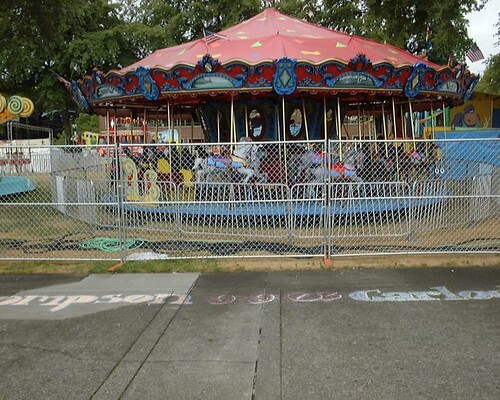 The carnival atmosphere of the Rose Festival Family Center contrasts with the reality of the effects of war. 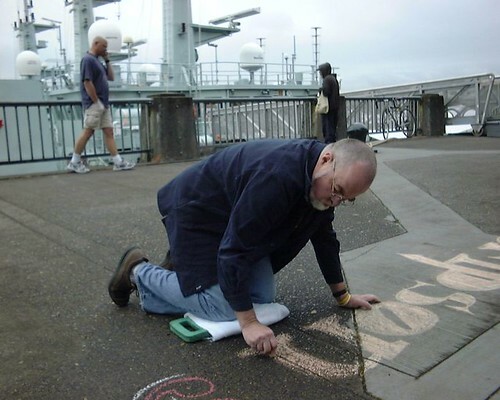 Nancy will be chalking Friday June 8th 9am – 2pm at harbor wall sidewalk near where it goes under the Burnside Bridge. Come say hello and help chalk. You are currently browsing the archives for the June 7th category.